It wouldn't be wrong to say that Lexus has added a new dimension to the Indian luxury car market. Prior to the Japanese manufacturer coming to India the luxury car space was the select reserve of European manufacturers, and that's besides the fact that Japanese luxury cars were unheard of in the country. What's more, Lexus is the only brand to offer hybrid luxury cars in the country, which makes them a unique proposition. 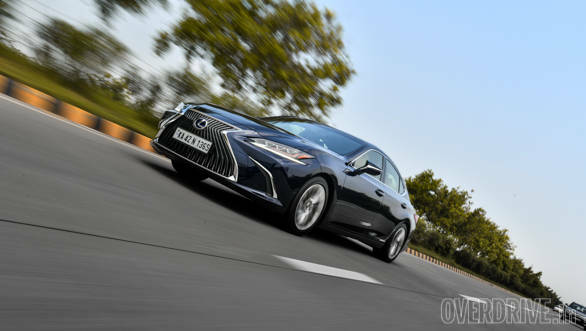 And the introduction of the new generation ES 300h sedan is a move from Lexus that could ruffle a few European feathers in the midsize luxury sedan segment. Can it? A few hours behind the wheel helped us figure out. But before I get to the driving bit or the car's hybrid technology I have to tell you about its design. It looks stunning in pictures and even more stunning in the flesh. And the deep blue hue of our test car made it look all the more alluring. The piece de resistance is the massive spindle grille, borrowed from the bigger LS 500h. It looks very distinctive and Lexus tells us the final design of the grille was achieved by some really meticulous calculations, which helped them position the indent exactly where it is for an elegant effect. In my books, the grille alone make the ES 300h look a lot more expensive than its sticker price. The slim triple projector headlights and sharp LED daytime running lamps add to the distinctiveness of the front end. The stance from the sides is lower now, which in conjunction with the sloping roofline makes for a coupe like appearance from the sides, accentuated further the sharp crease at the end of the window line. The alloys get what Lexus calls a hyper chrome finish and their design also adds to the car's classy appearance. The rear looks sharp, but somehow it isn't as classy looking as the front and sides. 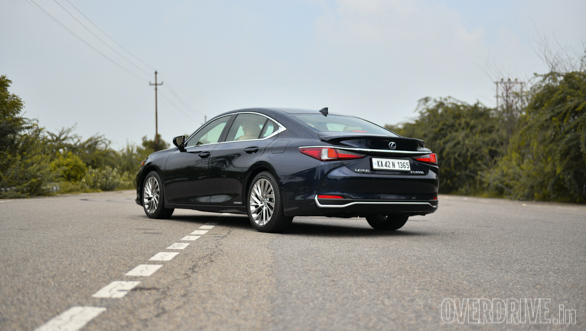 The interiors reek of the plush feel you expect of a midsize luxury sedan and the dark brown leather used instead of black makes it looks all the more luxurious. The interiors have been revised to make all controls more driver centric, which in turn has also helped in liberating additional space for the front passenger. The infotainment screen is a massive, 12.3 inch unit and takes centre stage at the top of the dashboard but is not a touchscreen unit. It is flanked by an analogue clock on the right, again, a trademark feature in luxury sedans. The screen is controlled via a touchpad with haptic feedback positioned next to the drive selector lever. Getting used to controlling the screen via the touchpad takes time, but once you get used to it, using the screen on the go is a breeze. 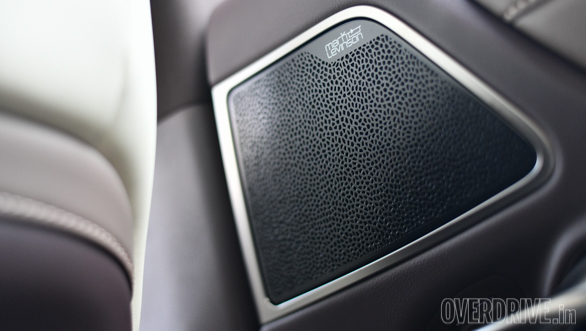 Lexus has equipped the ES 300h with a high end, 17 speaker equipped Mark Levinson audio system which offers a crisp audio quality. 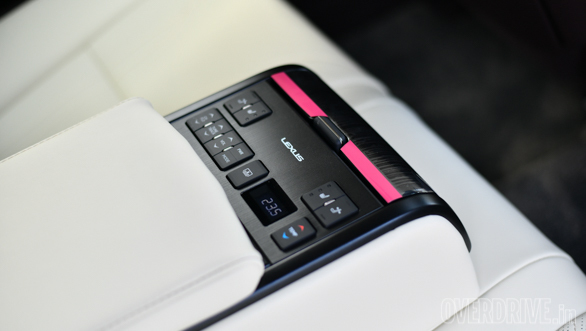 That said, it is surprising that Lexus is not offering Apple CarPlay or Android Auto connectivity, though Mira cast allows you cast your phone's screen onto the infotainment display wirelessly. The steering wheel is compact and feels sporty to hold and also gets a set of paddle shifters. The instrument cluster is a crisp digital display, and its interface changes according to the driving mode chosen. The ES 300h also gets a detailed head-up display, which can be adjusted for positioning and is a nice feature to have. The cabin overall and the dashboard in particular boast a rich feel, but the air-conditioning switches under the infotainment screen look plasticky. Expectedly, there's a greater focus on rear seat comfort. The ES 300h offers generous amounts of legroom at the rear, as it is based on Lexus's new global architecture platform which has increased the car's wheelbase. 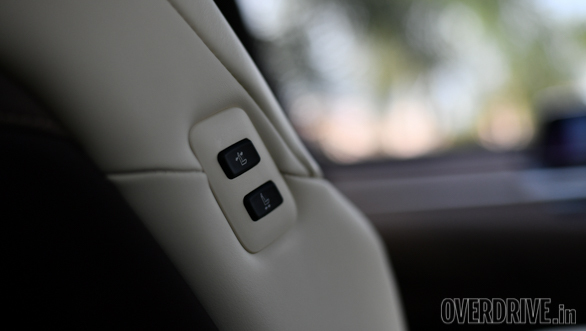 The front passenger seat comes equipped with an additional set of controls that allow either the driver or rear seat occupants to adjust the seatback or move the front passenger seat to liberate additional legroom. The rear seats can also be reclined electrically by 8 degrees which may not sound like a lot, but it does make the rear seat more comfortable. Controls for the same are placed on the central arm rest. The rear seats are only heated unlike the front seats which also get ventilation, which is odd. Lexus has moved the batteries from the boot to under the seat this time, which has helped in improving boot space to 454 litres. The lower placement of the batteries has also helped improve the car's dynamics, something which has been focused on extensively this time around. The ES 300h is also the only car in its segment to feature a full-sized spare wheel and despite the spare wheel being placed in the boot, luggage space is impressive. The boot also gets a remote opening function with a little kick and interestingly, a second kick when the boot opens up will also shut it for you. Neat! 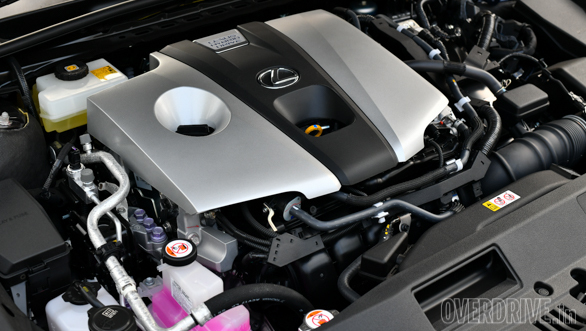 The ES 300h is powered by a 2.5-litre, four-cylinder petrol engine and an electric motor. Output for the engine is 178PS  up from 160PS earlier  and 221Nm. The electric motor is lighter than before but its output is down by 23PS as compared to the older ES and stands at 120PS. Combined output for the hybrid powertrain is 215PS, which is impressive. More importantly, despite that output, claimed fuel efficiency is 22.37kmpl, a 25 percent improvement! Press the start button and you are greeted by nothing but silence and the sounds of the electric motor setting up to let you move forward once you engage drive. 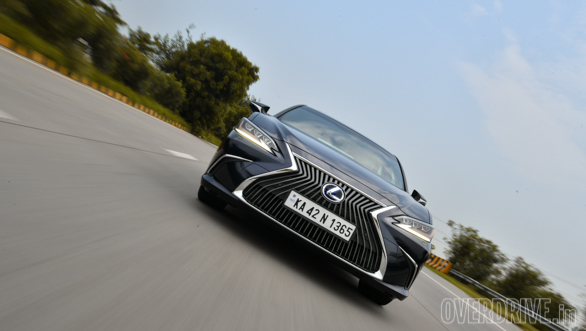 The ES 300h can take off in EV mode alone provided the batteries have enough juice, if not, the engine comes on to send power to the front wheels. You can also monitor the power train's work via graphic displays on the instrument cluster and the infotainment screen both, which tell you whether it's just the engine powering the wheels or the motor or both, as also whether or not the battery pack is being charged. 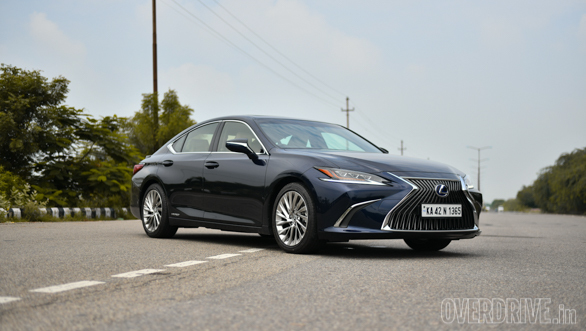 Lexus has also worked on improving quietness inside the cabin further  the ES 300h has always been regarded as one of the quietest cars in the segment and the new one is even better. There's a sense of calm inside even at highway speeds, which is sure to impress the chauffeur driven lot of buyers. The ES in fact is more likely to be bought by buyers wanting to enjoy the comfort and luxury of the rear seat rather than those looking for a seat of the pants driving experience. It isn't exactly a driver's car thus, and while it feels quick and eager to get to speeds, acceleration is always extremely smooth and linear. The eCVT does its job well and makes for smooth progress as well, though the typical rubber band effect of CVTs does make its presence felt. The ES runs on 18 inch wheels and there is a sense of firmness to the car when going fast over undulated surfaces or expansion joints, but the suspension does a good job of ensconcing occupants in comfort. That's thanks to the new multi-link suspension at the rear as also the new chassis. 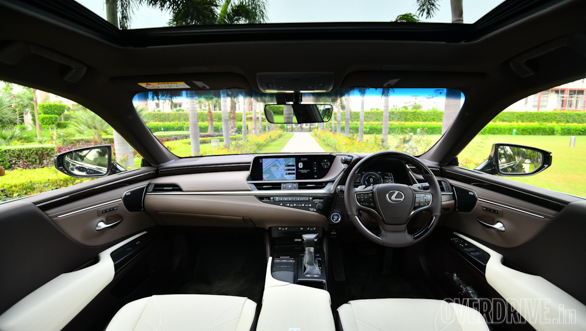 Additional sound deadening material used throughout the cabin, including most of the floor pan will make sure you can enjoy the crisp audio quality from the Mark Levinson system well, while the likeable ride quality and plush feel will ensure you do not feel tired even if you spend extended hours in the car. The Lexus ES 300h makes a strong case for itself then, if in the market for a midsize luxury sedan that stands out from the crowd and also helps you make a statement with its hybrid powertrain. The stylish exteriors and luxurious interiors in fact help the car distinguish itself well from its German rivals like the Mercedes-Benz E-Class, Audi A6 and BMW 5 Series as also the Jaguar XF. And at Rs 59.13 lakh ex-showroom the car is priced well too. The ES in the car's name stands for 'elegant sedan' and I can confirm that in its newest avatar the car has only gotten more elegant.